When this idea first came up on the Crew forum, I wasn't sure which 5Days I wanted to take on. 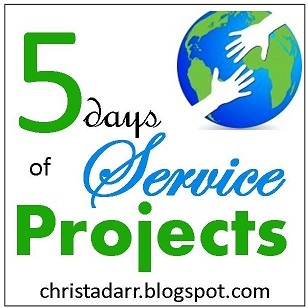 I suggested a few, and got a couple of comments about how 5 Days of Service Projects would be a good one. I decided to go with it... but where I was going to go, I wasn't sure. So, for the past few months, I have been thinking about how am I going to do this. I have finally decided that over this week, I am going to share with you some of the service areas we are involved in in our community and be here to encourage you to get involved in your area. I will help out with that in any way I can. First, I am going to start with our church. Sadly, it is the place we serve the least amount of hours. We help out during the week of VBS. The kiddos each help out in Children's Church once a month, and next week, they will sing special music. When we re- vote for positions, they are both going to sign up for praise team and sing during services. Do you have a church home? Are you involved in your church? I encourage you to look and see what ways there are for you to serve your church, your community or your world. we are extremely involved in our church - sometimes I think too much!! I have learned to pray before saying yes though :). One of our favorite ministries is we go as a family and fill the pews with the envelopes and sharpen all the little pencils. We really enjoy that!